Plan a romantic Adirondack wedding set amid the natural beauty of this idyllic Upstate NY region. From the intimate village setting of Lake Placid set amid the High Peaks to the lively and festive beauty of Lake George in the south, you will find ceremony sites, reception venues and honeymoon accommodations for every taste and budget. You can say “I do” on a mountainside and honeymoon in a lean-to, or marry in a pristine white chapel and dance the night away at one of the Adirondack’s many elegant full-service resorts. If you prefer a private and intimate setting for just the two of you, there are countless inns, bed and breakfasts and exclusive hotels that will gladly accommodate your needs and share in the joy of your special day. Destination wedding guests will love the opportunity to plan a mini-vacation around your festivities, exploring a region that spans 6 million acres and is home to 46 high peaks, 2,000 hiking trails, 3,000 lakes and ponds and 30,000 rivers and streams. 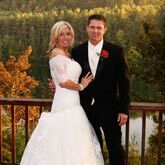 Our guide will help you find Adirondack wedding vendors who can help you arrange every detail, from start to finish. Whether you are planning a ceremony that’s large or small, formal or casual, traditional or theme-based, you’ll find everything you need at ADKWeddngs.com. Looking for Wedding Reception Venues? From casually rustic to breathtakingly elegant, the Adirondacks have it all. Browse through reception venues at hotels and resorts, country clubs, inns and restaurants? Want to hold your reception outdoors amid the natural beauty of the Adirondack Mountains? Or in the middle of a beautiful crystal clear lake with the treeline all around you? You can find it here. Perched on a wooded point overlooking sparkling Echo Lake, on the grounds of Camp Echo Lake, The Lodge has been the destination choice of brides and grooms for truly unique Adirondack weddings for years. The Lodge is a spectacular venue for rehearsal dinners – Adirondack style.